One of the great things about living here in Hawaii is having access to the many fruits and herbs that grow all around. From moringa to mangoes to passion fruit to pomegranates, the island is abundant in vegetation baring health enhancing foods. 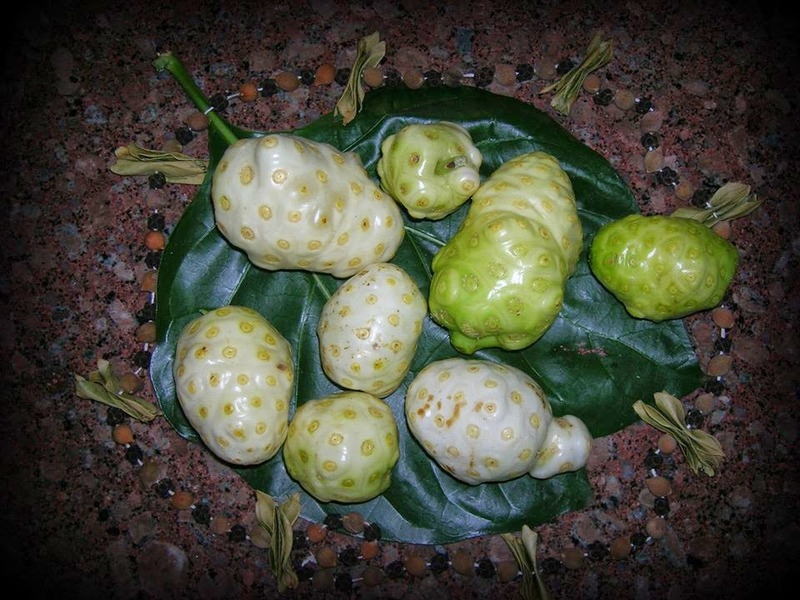 One such fruit that I consumed regularly throughout my pregnancy is noni. Scientifically known as Morinda citrifolia, the noni fruit hosts many health benefits essential to optimal functionality of the body. I won't list all of those benefits here, but just to give you an idea, it has been used in the treatment of conditions including diabetes, high blood pressure, and cancer. It's also known to be anti-bacterial and anti-inflammatory. I recommend this site for more insight into this phenomenal plant. Also, a quick Youtube search will also turn up plenty of videos highlighting the fruit. Our way--and a very common way--of using noni is by placing the fruit in a container and allowing the juice to drain from the fruit over the course of a few days. Then we drink the juice. It's that simple. Now, for anyone who isn't accustomed to strong tastes that come along with ingesting certain natural foods, noni juice may be difficult to handle at first. I mean, I'm used to drinking/eating the types of foods that might generally cause one's face to contort, and noni still shocks me almost every time. However, it can be mixed with other beverages to make it more palatable. In addition to drinking it straight, we mix it with homemade ginger, citrus, and fruit juices. I drank noni juice so often during my pregnancy that we gave the baby growing inside me the same name. We didn't know the gender until the day she was born (although we knew intuitively we'd have a girl), but that nickname was fitting, and this is her nickname even now. Noni. If you can, I do recommend you include noni as part of your daily nutritional intake in whatever form you can get it. It's available as juice and also as capsules and powder. We haven't drained any of the fruit in a while, and even though I've got my own special Noni (*big smile*), I do look forward to once again consuming the juice.